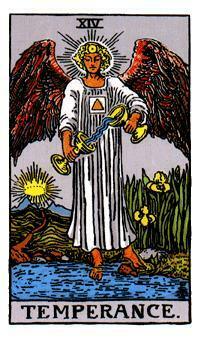 Weekend Reading: Temperance from the Rider Waite Smith Tarot. This is traditionally known as a card of balance, but it's really more than that. It's about making subtle shifts (rather than significant ones) to bring yourself into alignment. And it's also about alchemy. So if you have too much on your plate this weekend, but have obligated yourself to do it all, make some subtle shifts. Leave one place early. Save the major grocery shopping for next week and just grab enough stuff to get you through the weekend (and the express lane). Vacuum and let the dusting wait for next weekend. The art of alchemy is knowing just how much of each element you need in order to make the perfect blend. Sometimes it's not our obligations that stress us out so much as the lack of boundaries we place around them. So reconsider your schedule this weekend and do enough to meet obligations, but not enough to lose your balance.